We at TECH N’ WHEELZ are eager to write about achiever’s and especially if they do something different from the norm. That’s why, we were intrigued to do an interview with Dr. Vani Parmar, Oncosurgeon at Tata Memorial Centre. She has been part of expedition drives with Mahindra Adventure, and drives including Leh Monastery Escape, Himalayan Spiti Escape and Kashmir to Kanyakumari Expedition. Q) How long have you been driving? A) Since last 21 years; Off-roading since last 3 years. Q) The vehicle you started riding/ driving? A) First Car and first love was a Maruti 800; Later Honda City ZXi. Now Mahindra XUV 500, Mahindra Thar and Maruti A-Star. XUV and Thar are daily rides. Q) Describe on how you got to where you are with your passion of driving today. A) Motivated by a good friend who had previously participated in Raid de Himalayas and later conquered Everest, I wished to also participate in Raid de Himalayas which I planned to do with a pathologist colleague who was an avid trekker with deep love for the mountains. Along with her , I registered first with Desert Storm in Feb 2014 as team Mahindra Adventure. Although I could not complete the last day of Desert Storm, my passion for driving esp challenging drives just got deeper. Thereafter, I started off-roading and trained at the Mahindra Off-Road Academy at Igatpuri and in 2015 acquired my own Thar which I have modified for off-roading purpose. More than rallying, I now enjoy off-roading and have qualified in both 2015 and 2016 Mahindra Great Escapes and participated in the semi-finals and finals of Mahindra Adventure Off-Road Trophy at Igatpuri. I also have been part of expedition drives with Mahindra Adventure, and some really memorable drives including Leh Monastery Escape, Himalayan Spiti Escape and Kashmir to Kanyakumari Expedition. Q) What about repairing your drive? Do you maintain and repair vehicles on your own? A) Not really, but I would love to master the same if I get the right tutor. Q) Are you associated with any car club/ motorcycle club? Q) Do you have any achievement that you take pride in? A) Ladies trophy holder at Mahindra Great Escape Lonavala in 2015 and in Mahindra Greast Escape Vagamon 2016; Best ladies co-driver trophy in Igatpuri Off-roading trophy finals in 2016-17. Q) Do you have any motoring heroes? A) Yes.. Rallying Hari Singh, Gaurav Gill, Amitrajit Ghosh and navigation Ashwin Naik and Musa Sherif; Riding CS Santhosh; Off-roading Sibi Paul. Q) How are women riders/drivers treated by most people and by male motorists? A) Good drivers are treated with awe and respect with fellow off-roaders and riders. But overall on road male motorists feel threatened by good female motorists and behave accordingly, sometimes even irrationally. Q) Parents/ Friends- How do they feel of you participating in Motorsport events ? Any special comments. A) Strong support from my husband and family. Owe a lot to them for encouraging me in my passion even though I started late in my life and compete with way younger competitors. Q) The cars/ motorcycles you dream to see parked in your garage? Q) Message to other female drivers / riders? A) Be confident, you are good even though others will try to show you down. Believe in yourself first and follow your passions! Everything is achievable if you try for it! Heartiest congratulations to Dr. Vani Parmar. 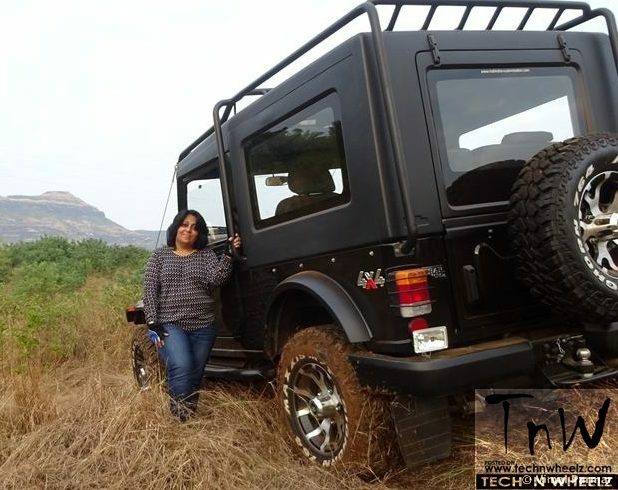 Kudos to Technwheelz for such a brilliant interview of such an inspiring lady off roader. Keep up the wheeling spirits. Thanks for the comment Ritu.